I simply hadn’t developed the skill very much. But for the most part I think it’s because I was torn between my idealistic desire to eat mostly whole foods, and the reality of being a young, inexperienced, low- budget, convenience-seeking mom cooking for myself with PKU plus a husband with opposite nutritional needs. 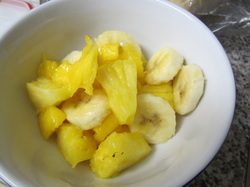 Easy, yummy pineapple fruit salad. With Summer around the corner or already here for some. 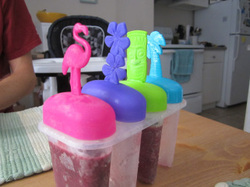 In my first attempt at popsicle making I used the frozen triple berry medley and rice milk. And I threw in a strawberry popsicle I had in the freezer. These were pretty hearty -– a little berry-heavy, so next time I would probably do more rice milk. But overall they were pretty good! Definitely cooled me down on a hot afternoon. 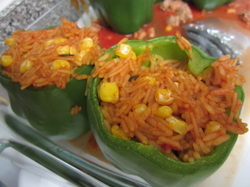 Stuffed peppers PKU friendly as well as traditional. Sometimes it takes someone asking questions to get your thoughts out. Well, Amanda Cosburn has been asking for stories. 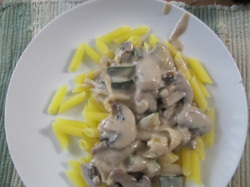 This recipe is an adaptation of one I recently saw demonstrated on one of our local weekend morning news shows. Using roasted bananas provides a natural sweetener and also adds fiber and potassium into the PKU diet. Hair loss experienced by PKU patients returning to the low-protein diet is temporary. Diet Compliance: How we can better empower people with PKU to follow the diet and reap the benefits? The annual cost of medical formula for PKU averages $7,100 per year, per person. I wondered what this nifty tool could tell me about the history of PKU and how its treatment has evolved over the years. I did a little bit of research on the things that addicts say and here are some of the ones that I found that apply to myself and my PKU. I can't wait to become a Maternal PKU Mentor and start helping women have happy healthy babies. Those of us living with PKU do not need a reminder about just how expensive it is to remain on-diet; however, there is certainly a bit of vindication whenever a peer-reviewed, academic journal reiterates this point. "I dream not simply of cures, but the endless possibilities for our world when the 250 million living with rare diseases today can invest their full energies into improving this world, not simply surviving or maintaining their health." The problem is when we have pudding. Lily's getting tired of her Hunt's lemon pudding cups (0 phe). She does love them but would like a little but of a variety. Well, this past month has been an interesting one. As you all know, or should know from my previous posts, I did the 30 day Kuvan trial. I never thought it would entail so many things. I had to be very careful in every aspect of my life, which is not uncommon considering I have PKU. I often bring cook books from my travels. 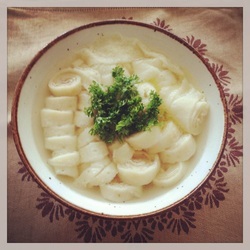 Today we’re cooking a Viennese traditional soup with pancakes. During this long, President’s Day weekend, I was looking for ways to shake-up the spaghetti and marinara I seemed to be eating all the time. I wanted to try something new and eggplant is something I did not have a lot of experience cooking. I’ve said this before on PKU Parlor, but the ability to plan and organize is going to be instrumental for me adhering to the low-protein diet. 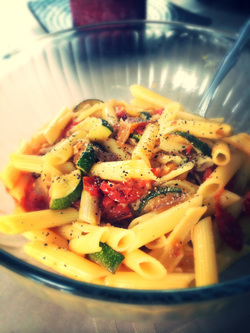 Earlier today, I decided to try my hand at adapting this family recipe for a low-protein PKU diet and I was extremely pleased with how well this dish turned out! Getting through airport security with formula can be interesting. I bring my formula for the day in a little cooler. Now, as we all know, we are not allowed to bring liquids through. But I do it every time! Going from a completely liberated diet to one that consists of limited protein intake can be rather intimidating when you look at it from a 25,000-foot view. One big thing I am sure we all do is meal adaptations. Especially in a family, this becomes extremely useful. I’m continuing in realizing my New Years revolution. One of them, as I already wrote before, is, that I want to have veggie-days, only fruits, low protein milk and veggies allowed, of course water, tea and soup, too. This is great because I don't have to try to estimate the phe of dinner and cram food into her when she wants to be done. Aleksandra Pisarek wrote that she is the mother of an 8-year-old boy with PKU who will require lifelong treatment to avoid brain damage. I am three months along. I wanted to post about this because this is an important topic for phenylketonurics. Some people have asked how being pregnant is affected by PKU. So here’s my answer! Do you make yourself a victim of what happens to you? It can be very tempting, but it won’t get you anywhere. From Christmas treats to gifts, the whole family had a good time making a few tweaks to make Christmas special for my kiddo. Lily also used colored sugar to decorate the cookies. Lily had a blast decorating the cookies, but the best part was...eating them! At first Lily was a little hesitant on how to eat the soup. We had to show her how to not let it dribble down her chin! Once she got the hang of it, she loved it. Recently on the SHS/Nutricia Community Page on Facebook a Loprofin Fruit Cake recipe was posted up especially for Christmas and today I attempted it. While most holiday parties are likely going to present plenty of off limit high protein foods, I have learned some tricks so I can still enjoy some yummy food. So that you are reminded that your decisions will impact real people, here is a brief background on me and my experience living with PKU: Thanks to newborn screening, I was diagnosed with PKU at birth and immediately placed on a low-protein diet. You'll never make an impact on this world if you don't just step out and do something. I think it's healthy for me to talk about it, especially because I've realized all of this life experience motivates me in my PKU and new born screening advocacy.